Phantom's new VEO 4K high-speed cameras are compact, rugged and packed full of features. It's small form factor allows for easy gimbal operation or camera rigging. At its full 4096 x 2304 resolution the VEO 4K is capable of capturing up to 938 frames per second (fps), or 1000 fps at 4096x 2160. A reduction of vertical resolution will further increase the speed. The sensor can operate in global shutter (standard) or rolling shutter mode for increased dynamic range and to eliminate the need for black references. With the maximum RAM configuration of 72 GB, at 1000 fps the VEO4K-990 provides more than 5 seconds of record time. At full 8K resolution, the MONSTRO sensor captures 35.4 Megapixel motion and stills with low noise and now ships with IPP2, RED’s improved image processing pipeline. WEAPON 8K VV provides the most advanced VFX solution with next-level creative flexibility. Blazing-fast 300 MB/s data rates allow you to take advantage of the best possible REDCODE® settings — and record proxy 4K Apple ProRes or 4K Avid DNxHR formats, simultaneously. As a member of the DSMC2® camera lineup, WEAPON 8K VV benefits from the advanced modularity of the RED ecosystem. Featuring cable-free peripherals, an integrated mounting plate, wireless control, and compatibility with a growing number of DSMC2 modules and accessories. WEAPON also supports interchangeable OLPFs and lens mounts—empowering you to make the most of all of your VV compatible PL and Canon lenses. The RED Weapon with Helium 8K S35 delivers stunning resolution and image quality—creating clean and organic images that bring your footage to life. RED has taken the next step in exceeding the flexibility and beauty offered by film. At 35 Megapixels and 60fps, Weapon 8K offers 17x more resolution than HD—and over 4x more than 4K. This camera will be the backbone of your video production needs. With the EPIC-W, RED brings the EPIC name back to the forefront, featuring their HELIUM 8K Super-35 sensor. While other RED cameras use sensors larger than Super 35, the HELIUM is unique in that it allows for high-resolution 8K recording while using classic cinema lenses designed for the Super-35 film format. While 8K exhibition is not mainstream, the extra recorded resolution is helpful for VFX artists and for future-proofing your productions for a time when 8K is standardized. The Panasonic Lumix DC-GH5S is a mirrorless Micro Four Thirds camera optimized for movie recording and low-light performance. Revolving around a 10.28MP Digital Live MOS sensor, DCI and UHD 4K video recording is possible at up to 60p and the large individual pixel size also affords impressive low-light performance to an extended ISO 204800, along with Dual Native ISO technology at ISO 400 and ISO 2500. Internal DCI 4K30p recording is available with 4:2:2 10-bit sampling and a full-size HDMI A connector can be used to simultaneously output to an optional external monitor or recorder. 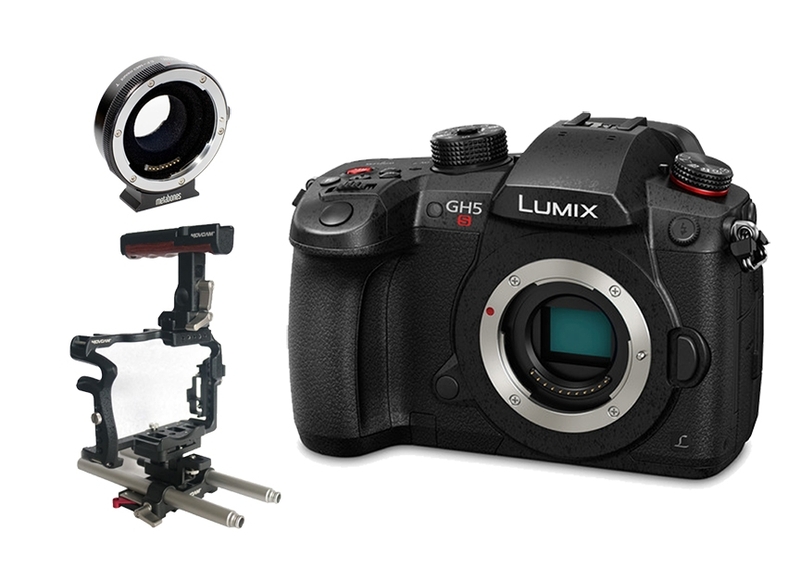 This GH5s Package pairs the powerful Panasonic GH5s camera with a trio of quality MFT zoom lenses. 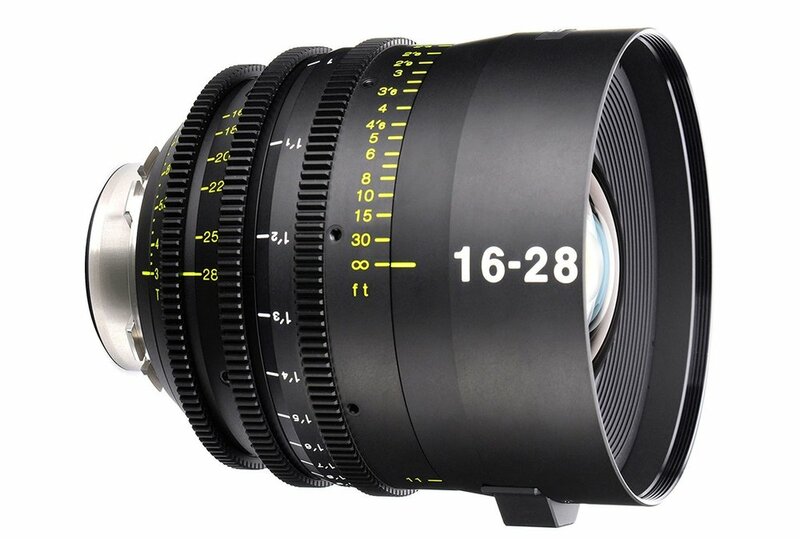 The effective 35mm focal lengths of these lenses would be 16-36mm, 24-70mm and 70-200mm. 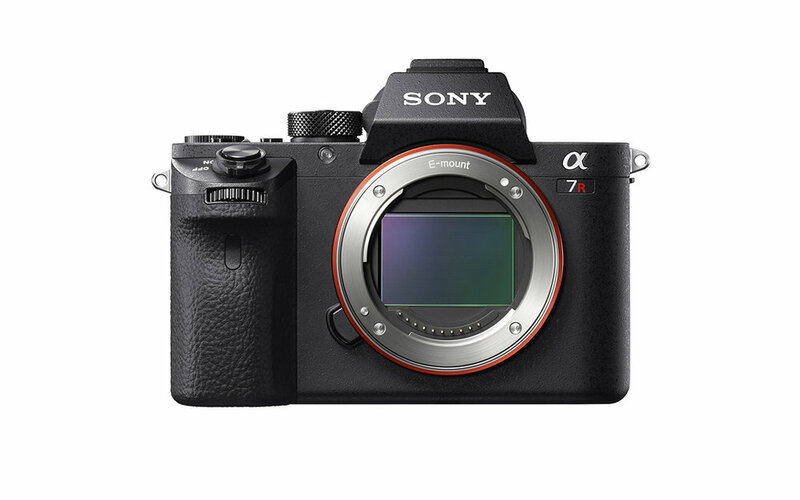 With a world's first full-frame 42.4-megapixel Exmor R back-illuminated structure CMOS sensor, the Alpha α7R II Mirrorless Digital Camera from Sony is prepared to take mirrorless imaging to another level. This sensor design both improves low-light operation and speeds up data throughout, enabling fast high-resolution stills and UHD 4K video recording. The Phantom 4 Pro from DJI boasts a 3-axis-stabilized gimbal camera with a 20MP, 1" CMOS sensor capable of shooting up to 4K/60fps video as well as photo bursts at up to 14 fps. The hull has been updated from the previous Phantom 4, now featuring magnesium alloy construction for increased rigidity and reduced weight. The FlightAutonomy system adds dual rear-vision sensors plus infrared sensing for a total of five directions of obstacle sensing and four directions of obstacle avoidance. Compared to the Phantom 4 Advanced variant, the Pro features the noted four, rather than two, directions of obstacle avoidance and offers a 5.8 GHz channel for the Lightbridge link, in addition to 2.4 GHz. 4K+ Zeiss Compact Zoom CZ.2 is as versatile as it is powerful and incorporates features never before seen on a lens of this kind. The Zeiss Compact Zoom CZ.2 70-200mm T2.9 weighs 6.17 lbs, a front diameter of 95mm and a close focus of 5'. 4K+ Zeiss Compact Zoom CZ.2 is as versatile as it is powerful and incorporates features never before seen on a lens of this kind. The Zeiss Compact Zoom CZ.2 28-80mm T2.9 weighs 5.5 lbs, a front diameter of 95mm and a close focus of 2'8". The Zeiss OTUS prime lenses are built to resolve 8K resolution, and are a perfect fit for the modern high-end video production. The OTUS primes from Zeiss feature the most advanced optics which provide unrelenting sharpness and highly corrected image quality. The set consists of an ultra fast 28mm, 55mm, and 85mm. Each lens opens up to a f/1.4. If your project requires the absolute highest image quality, the OTUS primes are a perfect choice. This Sigma Kit of Five T1.5 FF High-Speed Prime Lenses assembles 20, 24, 35, 50, and 85mm focal lengths in a hard-shell case. Use this wide range of primes to capture high-resolution, 8K-suitable images with your EF-mounted full frame camera. The cine-oriented style of these primes feature clickless apertures, geared focus and iris rings, and dual focus scales marked in feet. Standardized color reproduction, common 95mm front diameters, and similar physical attributes across the line of lenses enable smooth switching between focal lengths. Canon EF Cinema Prime Lenses designed for service in the cinema industry, while providing image coverage for a full-frame sized sensor. 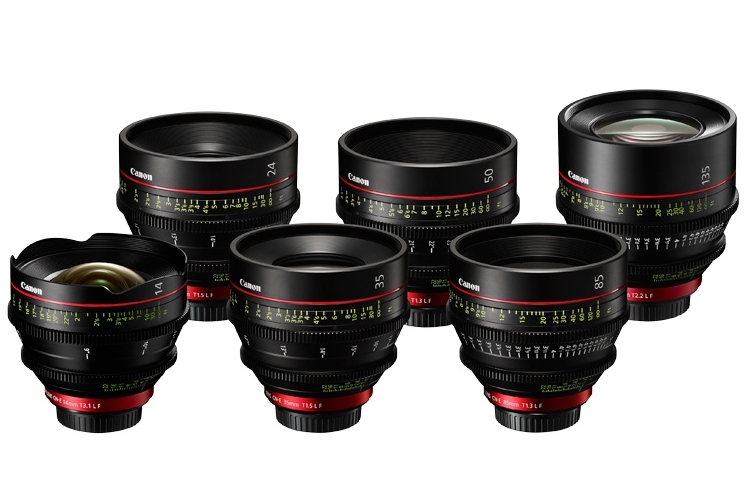 The set consists of an ultra wide 14mm T3.1, 24mm T1.5, 35mm T1.5, 50mm T1.3, 85mm T1.3, and 135mm T2.2. Each features an 11-bladed iris and a consistent form factor. The lenses are designed to deliver edge-to-edge sharpness and brightness, and to provide a cinematic image, even when using a 4K camera. The Tokina Cinema Vista 16-28mm II T3.0 is a wide-angle zoom lens that covers full-frame sensors and is designed to provide sharp images even when recording images at 8K resolution. Featuring a parfocal design and a T3.0 aperture throughout its zoom range, the lens holds focus throughout the zoom range and does not ramp exposure as you get to the extremes of the zoom range. The lens design also reduces the breathing and image shift sometimes encountered while zooming and focusing. It uses aspherical elements and super-low dispersion glass in its optical design for optimal color correction and minimal distortion. Comes with either PL or EF mount and focus scales marked in feet. The Cinema AT-X 100mm T2.9 Macro Lens from Tokina is a true 35mm, full-frame, 1:1 macro close-up lens that fits EF mount cameras. The lens's optical design is 4K-ready, super sharp, high contrast, and exhibits very low distortion and chromatic aberrations. Focus breathing is very well controlled, and the lens has a de-clicked, 9-bladed, curved iris for beautiful bokeh and precise exposure control. The wide T-stop range, from T2.9 to T32, allows for maximum control of exposure and depth-of-field, which is critical when working very close to your subject. The lens achieves maximum magnification at a working distance of 11.8". This allows enough space for lighting, the camera operator, and the subject to work comfortably. Sigma's Art line; well-suited to creative image making due to its large, constant f/1.8 maximum aperture and ability to produce aesthetic bokeh by way of a nine-blade circular diaphragm. The range of focal lengths it covers, from wide-angle to normal-length, is nicely situated for everyday and artistic shooting applications. The Sigma 18-35mm f/1.8 DC HSM Art Lens for Canon is a wide-angle to normal-length zoom lens that features a fast, bright constant f/1.8 maximum aperture 35mm-equivalent focal length range of 28.8-56mm. Four aspherical elements in its construction, as well as five Special Low Dispersion (SLD) glass elements help minimize various aberrations and distortions throughout the zoom range, as well as provide greater image sharpness and clarity. A Super Multi-Layer Coating has also been applied to lens elements to reduce surface reflections, lens flare, and ghosting, to produce images with higher contrast and color fidelity. Canon EF Lens/Full Frame Hyper Sonic Motor AF System with Optical Stabilizer and accelerometer. Minimum focus is 102.4". Splash and dust proof mount. Zoom lock and manual override switches. Shoots beautifully on the RED Helium at 8K. Includes lens hood and rotatable tripod collar. Marked by the tell-tale red band around the barrel of each lens, Canon’s professional L-series is renowned for its exceptional mastery of mechanical and optical design. These lenses are tough, many with rubber weather seals in place to prevent contamination from dust, dirt, or moisture. They each contain a combination of ultra or super low-dispersion glass, as well as fluorite and aspheric elements. In addition to effectively reducing unintentional distortions such as blur, haze, and chromatic aberration, these high-quality elements expertly render accurate color detail and contrast. Non-rotating front elements make it easier to adjust and use circular polarizer filters, for optimal results. Superior optics make for an overall faster, sharper lens that simply outperforms many outside of the L series. By offering a unified design, the MōVI Ring Pro lets the camera operator grip the attached MōVI Pro from nearly any angle. For dual-operator configurations, the MIMIC syncs with the MōVI Pro, allowing one operator to control the camera movements while a second operator moves the camera rig itself. The MIMIC has Bluetooth and 2.4GHz radios built-in for device and accessory communication. The Bush Pilot is a compact knob that quick releases to the MIMIC. It gives users the ability to control Focus, Iris, or Zoom on MōVI Pro. Users can quickly change between axis of control via the MIMIC screen. 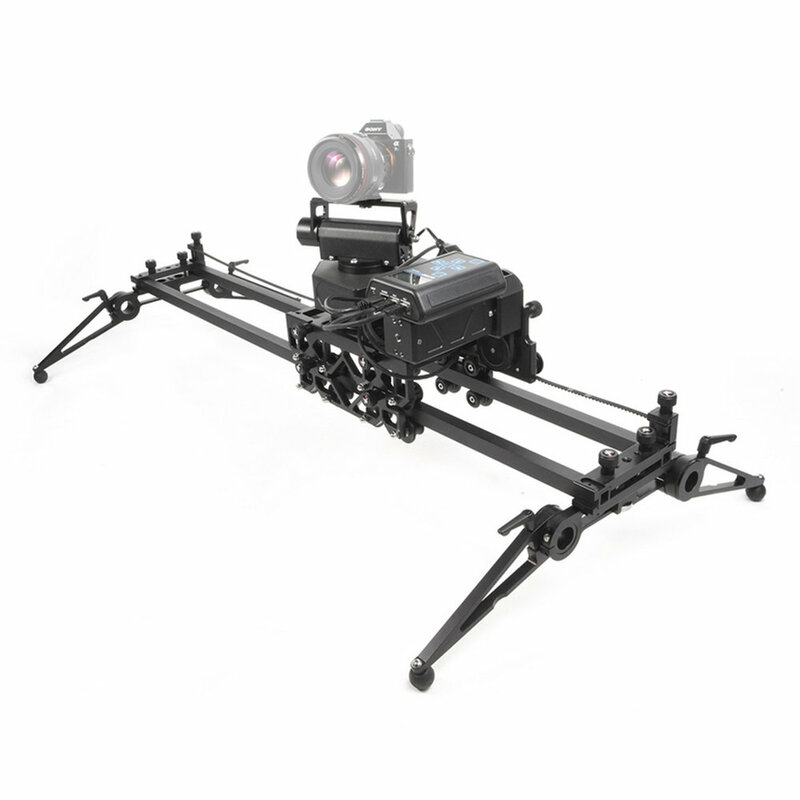 The MōVI M10 3-Axis Motorized Gimbal Stabilizer from Freefly is a camera stabilization system that uses three motors and an IMU (inertial measurement unit) to detect and counteract unwanted movement along three axes: pan, tilt, and roll. The MōVI Controller has redefined Dual Operator Mode for the MōVI. Control of pan, tilt, and roll has never been more intuitive and with the ability to tune and adjust your MōVI's parameters on the fly: the Controller will change the way you use the MōVI on set. The Easyrig Cinema 3 500N is a body-worn support system for camera operators working with camera rigs weighing 24 to 28.5 lbs. The system works by using a suspension line to support the weight of the gimbal rig, taking the load off of your shoulders, neck, and arm muscles, and distributing it across your torso. This lets you shoot for longer periods of time without worrying about arm fatigue. The Serene is a two axis spring arm that attaches at the end of the Easyrig arm. It stabilizes vibrations and motion errors on the vertical axis that comes from walking or running with the rig. It also stabilizes side to side errors in the same scenarios by counter pivoting around it’s center axis. Hand wheels are no longer bound to techno cranes and high-end commercials. The Alpha Wheels bring precision framing to every set, even virtual ones. Bring unparalleled precision and flexibility to your gimbal with the Alpha Wheels. The Alpha Link S.Bus XR is the first all-digital wireless transmitter designed specifically to connect wheels to gimbals. It dramatically simplifies wheel setup for Ronin, MōVI and Tilta users. With Brass Wheels, high inertia and precise movements become the name of the game. Brass wheels are more than 3x as heavy as aluminum and use pure physics to smooth your shots. The Second Shooter is a revolutionary motion control system that boasts a sleek and compact design, feature-rich operation and an incredibly intuitive user interface. Featuring 100% repeatable motion control for live-mode, looping, time-lapse and stop-motion applications. This system controls Pan, Tilt and Slide with one easy to use controller. Unlike stepper motor based moco systems on the market today, Second Shooter receives feedback communication from digital-encoded motors in determining motor positions to ensure precise control. Second Shooter provides users with ultra-smooth and quiet motion control, making it an outstanding companion on any job. Paired with the Shuttle Pod Mini Slider, your video production will be ready for time-lapses and motion control shooting. The industry-standard 100mm ball base fluid head by the legendary OConnor. 12" pan handle, 30-degree bend, 11.5" pan handle extension, 60-degree tilt, carbon fiber 2-stage legs,and 53 lb payload. The cinema-grade motion picture standard by the legendary OConnor. Features a stepless pan and tilt drag fluid for ultra-smooth moves and a one-handed platform release lever for quick camera balance adjustments and mounting. The controls and a soft hand-rest are conveniently placed on the left for the operator's use. Includes 2-stage carbon fiber legs and a 2 piece handle. The FSB 8 is the strongest 75-mm solution from Sachtler and therefore the perfect partner for larger camcorders, smaller film set-ups and DSLR set-ups. Accommodates lenses designed for full-sized sensors as wide as 18mm. 2 filter stages that accept either 4x4" or 4x5.65" filter trays and the rear stage rotates a full 360 degrees. Available brackets for 15mm & 19mm rods. Adapter rings allow you to use this as a clip-on mattebox. Misfit is designed to be ultra compact and lightweight, yet has the field of view to cover wide lenses. Combining adjustable lightweight flags with 2-stage to 3-stage flexibility, Misfit retains the simplicity of a clamp-on matte box, and adds a range of innovative features. 114mm or 143mm sizes available. The SHAPE Telescopic Rosette Handles are left and right handgrips that can be attached to standard ARRI rosettes. Each arm features three points of articulation, combined with the approximately 2-3 inches of arm extension allows you to adjust the arms for your comfort. The spring-loaded locking levers allow you to easily adjust the angle of your grip. The OConnor O-Grips Double Jointed Set are configured to create double handles for custom applications, and can be used for payloads up to 44 lb (20kg). A titanium core based construction provides rigidity and stability for camera mounted operations. 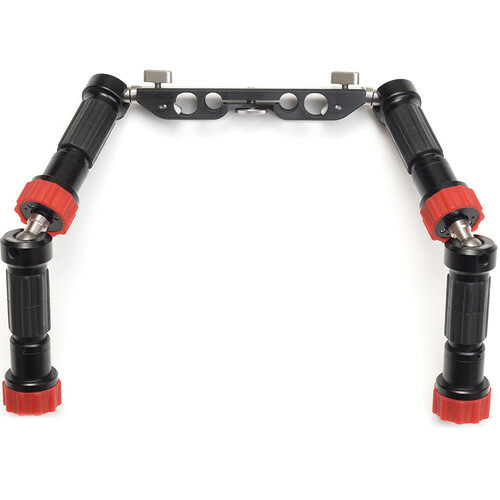 The O-Grips bridge supports the 15mm and 19mm Studio and 15mm LWS standard rod systems. The design of this filter has been optimized for use with digital sensors and to promote nearly flat attenuation of visible and infrared light. Due to imaging sensors' greater susceptibility to infrared light, compared to traditional film, color casts can occur when photographing darker subjects that require increased exposure times. To provide a high level of neutrality across the visible and infrared spectrums in order to eliminate color casts and ensure cleaner, truer blacks when using the NiSi 4 x 5.65" Nano IRND Filter, one layer of NiSi Optical Nano Coating is applied to each of this filter's surfaces. NiSi 4 x 5.65" Nano IRND Filters are constructed from optical glass for clarity as well as color fidelity, and measures 4mm thick. The Schneider 4 x 5.65" Hollywood Black Magic Filter Set can be applied to purposely reduce the appearance of blemishes and wrinkles. This can be useful for creating a more flattering result of a subject while highlight as well as mid-tone contrast is softened and glare is reduced. Additionally, a glowing effect around highlights is created which can further enhance a subject's appearance or produce a desired effect while overall sharpness is maintained. 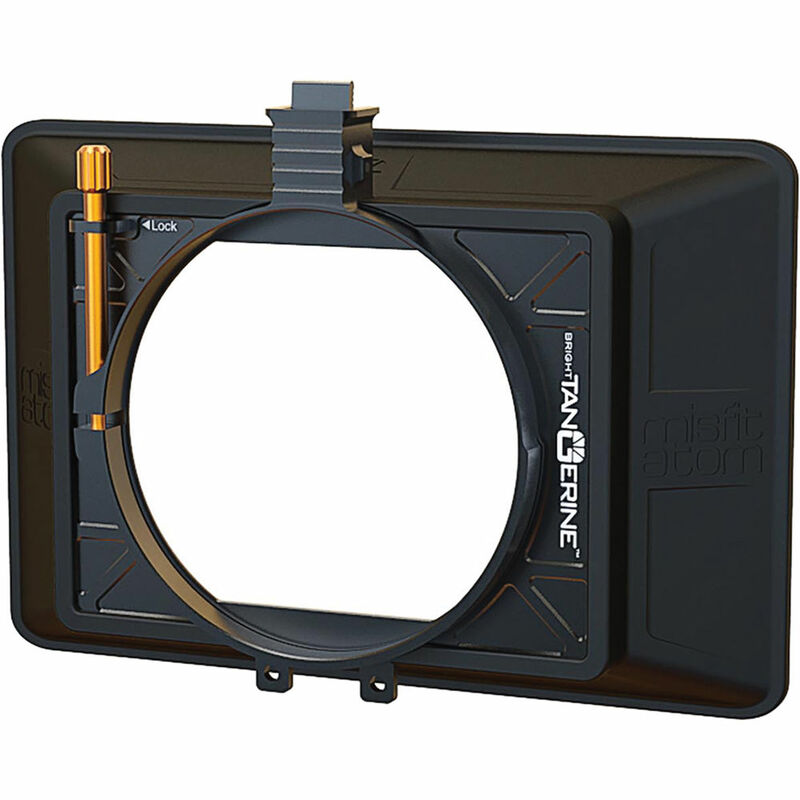 The Tiffen Multi Rota Tray can be used as a Polarizer, a Variable ND, or as a Cool/Warm Filter. The Rouge Underwater Housing is perfect for taking the RED cameras underwater for your film and video productions. It provides access to all important RED camera functions via 14 electronic push-button controls on dual Amphibi-grip handles and a menu panel. With both hands on the ergonomic grips, you can enjoy easy access to Record, White Balance, Shutter Speed, ISO, Aperture, and more. The housing is constructed from durable, corrosion-resistant marine-grade aluminum, which is anodized, painted and clear-coated for extra protection against seawater. To ensure you are notified of a breach in time to protect your camera against damage, a water sensor alarm is present on the housing. 4 auxiliary port holes accept HDMI and HD-SDI outputs, enabling you to view video playback on an optional external monitor. These specialty cables are available upon request. Capture video over, under, or near the water's surface with your RED digital cinema camera, thanks to this A-RED Underwater Housing from Ewa-Marine. This enclosure has a depth rating of 32.8' and uses a corrosion-resistant clamping rail seal to keep your valuable investment safe and dry. Easy access to all camera controls is provided right through the clear double-laminated PVC body, which also features a dedicated slot for the 9" RED touch LCD monitor and space for a 153Wh RED BRICK battery. The housing has an integrated, optically neutral, flat glass lens port, which accommodates lenses with a maximum length of 7.1", a maximum diameter of 4.2", and a maximum filter thread diameter of 95mm. The supplied adapter ring mounts onto a lens with a 95mm filter thread, fixing the front element of the lens to the interior of the port to hold it securely in place. Additionally, 77-82mm and 82-95mm step-up rings are included. The housing is delivered in a black carrying case with a waterproof interior. The ikan PT3100 is a through-the-glass teleprompter that is large enough for studio applications, while still retaining enough portability to be utilized on location. With a 15 LCD, VGA/HDMI AC-powered monitor, the PT3100 offers a large viewing surface along with the same features of the ikan PT3000. A host of new features can be found on the PT3100, all of which have been implemented to provide more practical solutions for your through-the-glass applications. Don't hassle with a teleprompter kit that positions your camera off the mark. With the PT3100s provided camera lift and the simple twist of a wheel, you can lift your camera into a perfect center position for the best through-the-glass application experience possible. The D600 Block Battery is a dual voltage battery designed for cinematic or lighting production applications where two different voltages are required simultaneously; or for applications requiring voltage regulation to less than 28 volts. The D600 provides a 560 watt hour capacity with regulated outputs of ~ 24 volts and nominal outputs @ 14.4 volts simultaneously. This package includes two D600 Block Batteries, and a quick charger (3.5 hr charge), which is perfect for powering both of your cameras while charging the spare battery. Featuring HDR preview backed by a 8-bit Color Intelligence engine with calibration capabilities, the 1703 can display a large brightness range, encompassing log formats and other expanded-range picture styles. The 1000 cd/m², daylight-viewable, 1920x1080 Full HD resolution display panel can be driven by one of two SDI inputs or an HDMI input. Each input has a loop output for connecting other gear in-line without the need for a splitter. All functionality of this monitor is accessed via the innovative Page Builder OS. By implementing full aluminum construction and the provision for separately available user-replaceable polycarbonate screen protectors, SmallHD built this monitor to survive the rigors of production in studios and in the field. The VZ-240PM-PL 24" 3G-SDI, 3D LUT & 10-Bit Video Production Monitor from ViewZ allows you to monitor SDI, HDMI, DVI, and analog video signals on a 1920 x 1200 resolution display. Two SDI connectors are provided, capable of handling SD, HD, and 3G-SDI signals with support for YCbCR or RGB 4:4:4 10/12-bit video up to 1080/60p. It also supports 2K (2048 x 1080) YCbCr 4:2:2 10-bit signals at 23.98/24p and 23.98/24PsF. Additional video inputs include composite, component, and S-video on BNC connectors, as well as one HDMI and one DVI input. The monitor features a native 10-bit panel, displaying 1.07 billion colors. You can choose to view your footage using the native color space of the monitor, or use the built-in 3D LUT cube to choose from pre-set color spaces including BT.709, SMPTE-C, EBU3213, DCI-3P, and Adobe Wide-Gamut RGB. Monitoring your footage on the same color space as your delivery format lets you accurate see how your finished project will look. The 3D LUT cube allows for gamut, gamma, and color temperature adjustments, for fine tuning your calibration. Monitor your camera's feed completely free of wires with the SmallHD 703 Bolt 7" Wireless Monitor. Borrowing the wireless technology from Teradek, the 703 Bolt can receive uncompressed HD wireless signals from Bolt 500, 1000, or 3000 transmitters up to 300' away with no perceptible latency. With this feature, anyone can walk around the set while monitoring a camera feed, perfect for directors and camera assistants. Furthermore, despite the presence of a wireless receiver, the 703 Bolt maintains a slim profile similar to on-camera monitors. On the rear of the display is the SDI I/O. Having dual SDI ports allows for A/B viewing of two different SDI signals, or the secondary port can be assigned as an output for sending an SDI signal downstream to another monitor, switcher, or wireless accessory. Housed in a Directors Monitor Cage, and powered via V-Mount battery, the SmallHD 702 Bright is both bright (at a 1000 cd/m² brightness) and sharp with a Full HD 1080p display and 1000:1 contrast ratio. Moreover, the LCD features optically bonded glass with anti-reflective coating. All this adds up to highly more accurate daylight visibility in high image quality, on a fairly large 7" screen. The RTMotion LCS (Lens Control System) gives you solid, reliable, precision wireless control of cinema and still-camera lenses. This super-low weight system features powerful, near-silent motors, FHSS interference immunity, and with a full 16bit digital transmission has an unequaled 1.5Km range and no noticeable latency (2ms). It's integral protected antennas to help prevent damage and is precision machined from aerospace grade aluminium billet. It features an automatic and manual (soft stop) calibration and a unique calibration algorithm and torque control to protect lenses. Transmit uncompressed 1080p video wirelessly over 3000 feet line-of-sight with the Teradek Bolt Pro 3000 Wireless Video Transmitter/Receiver Set. 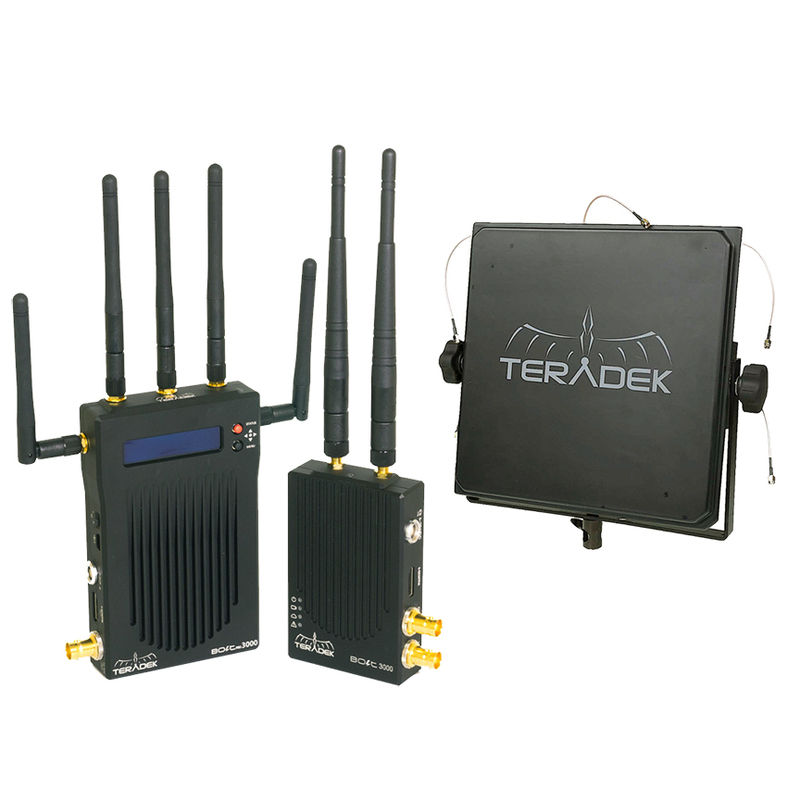 Included in this set are a Teradek Bolt Pro 3000 transmitter and receiver, both equipped with 3G-SDI input/output. The transmitter can pair with and multicast to up to four receivers (additional receivers not included). When transmitting uncompressed video, latencies of less than one millisecond can be achieved if no other video processing is necessary. The Vaxis Storm 1000+ft Wireless HDMI/SDI Transmission System utilizes today’s most advanced wireless video transmission technology, which can transmit uncompressed 3G SDI/HDMI HD video signal with no compression and zero delay. The system includes one transmitter and two receivers with OLED side panels for custom configuring. Utilizing a 5.1-5.9GHz frequency band and flexible software, it can be configured to licensed or ISM bands of different global regions and provides 10 workable frequency channels, supporting up to10 sets simultaneously. It can accept a wide range of DC power input, making the system workable with several different battery types and can also sustain ±8 kV ESD (HBM, contact discharge). The industry class metal case and professional heat design provide robust reliability. The Paralinx Arrow-X SDI 1:1 Wireless System is a revolutionary HD Video Transmission system offering Realtime Wireless HD with robust long range for your Television, Film, Broadcast, Industrial or UAV/UAS application. The Paralinx Arrow-X SDI transmitter transmits full-HD 1080p/60 with a range of up to 700' (215m) with default antennas (longer range possible with optional antennas) and still maintains an incredible sub 1ms latency glass-to-glass. Both the Arrow-X HDMI transmitter and receiver feature 2-Pin Lemo power connectors capable of a wide 7-17V unregulated input voltage. The Arrow-X features 3G-SDI input (transmitter) and dual 3G-HDSDI outputs (receiver). 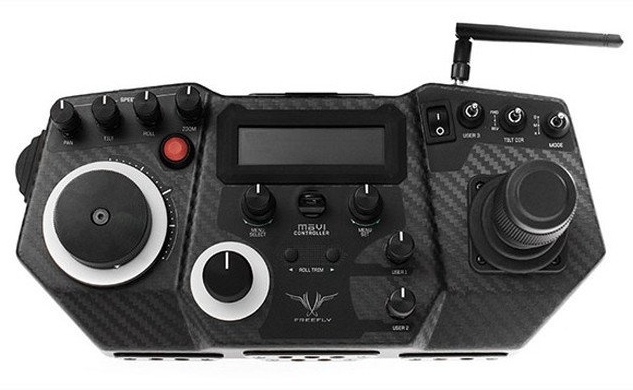 Much like the popular Paralinx Tomahawk, the Arrow-X transmits Full-HD video (up to 1080p/60 4:2:2) with less than 1 millisecond delay and is capable of handling up to 4 simultaneous receivers. Serv Pro is a hardware streaming device that allows up to 10 iPhones and iPads to monitor a video feed in HD over WiFi. Perfect for script supervisors, hair & makeup, classrooms, and documentary shoots, Serv Pro offers a compelling monitoring alternative to zero delay wireless video systems. Each Serv Pro feed is streamed at 1080p with just a 2 frame delay. The video stream also includes a stereo audio channel that can be enabled or disabled from the Vuer iOS application. VUER can monitor up to 4 Serv Pro feeds at the same time, all in 1080p and all at the same 2 frame delay. You to use vectorscopes, false color, focus peaking, and more on each Serv Pro feed you’re monitoring. The application is free to use and can be customized to to allow users full or limited access to the toolset. With a range of 1000ft, the Link is the perfect dual band 2.4 / 5 ghz WiFi router to link all of your on set wifi devices. Designed for use in broadcast and cinema applications, Link offers incredible range, several power options and a chassis suitable for regular abuse in the field and on set. Link’s quad core processor and significant internal memory ensure high data throughput despite numerous clients utilizing the network at once. Compared to typical consumer access points, Link offers optimized buffering and packet re-transmission, allowing you to maintain a consistent connection even in tough RF environments. With several ¼”-20 mounts, the device can easily be mounted onto light stands, DIT carts, or OB vans. The DS3 Digital Sputnik is the perfect LED Lighting for the modern film and video production. The DS3 features 0-100% flicker-free dimming, 1,500-10,000K with +/- green tint, full RGB and primary color rendering. The lights can be controlled remotely via Wi-Fi with a separately available Wi-Fi Control Module or via DMX with a separately available DMX module. Each light draws 140 watts of power and connects to the single DS3 power supply with a long, 30' cable. The included power supply works on 90-260 VAC for international use. 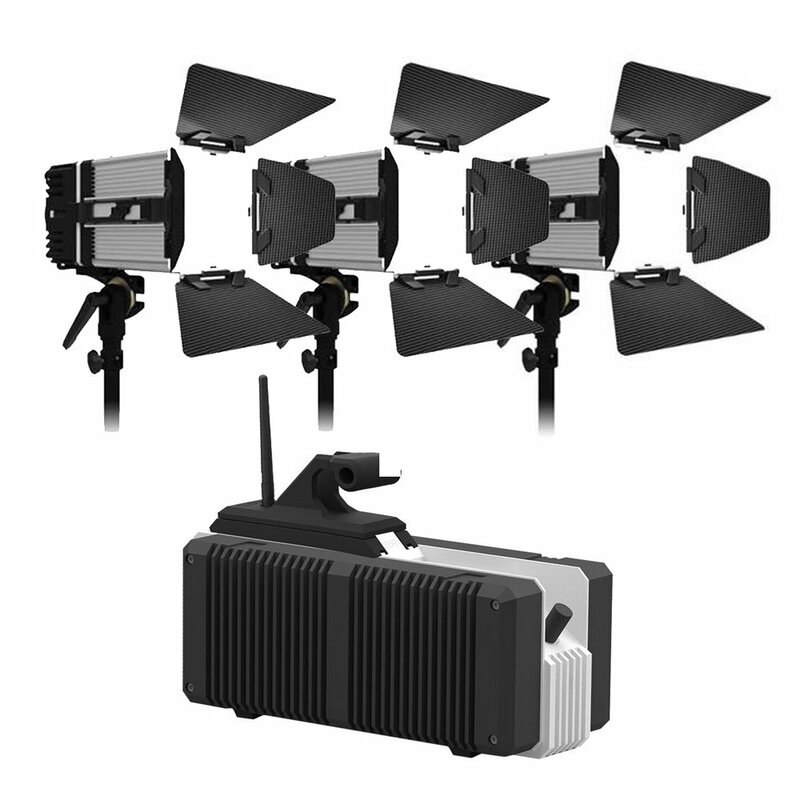 The DS1 is able to output light equivalent to that of a 100W HMI or a 500W tungsten fixture while measuring just 4 x 4", this light ensures portability without sacrificing power. It also uses an RGBW LED module which provides color temperature adjustment from 1500-10,000K as well as full color control, including primary color rendering. This single light system can also be expanded with ease to add more light. The fixture offers a focused beam angle of 20° along with flicker-free dimming from 0-100% for maximum flexibility. Users will also be able to control this using local controls and an OLED screen. Also, the light can be run off of batteries thanks to a dual V-mount battery plate setup on the PSU, or it can be powered by the included 90-260 VAC adapter. And, it features built-in Wi-Fi and DMX for remote control over the light. The S2 LiteMat takes lighting to the next level with its thin and ultra lightweight housing, soft color-correct Hybrid (bi-color) output, and convenient mounting options. The new S2 LiteMat is nearly 40% brighter than the original LiteMat, has better color quality, and a widely extended Kelvin range all without an increase in power draw. In addition, overall CRI increased to 95+ with a matching TLCI of more than 95 as well. With all of these tremendous advancements, S2 LiteMat remains compatible with all existing LiteDimmers, LitePower supplies, and cables. The P360EX is one of Fiilex's most versatile lights, combining power, portability, efficiency and durability all in one package. The P360EX provides a 400W equivalent output and it is both dimmable and color tunable between tungsten and daylight. The LED's high CRI (≥93)makes your colors look natural and vibrant, and an optional DMX Connection Box conveniently incorporates the light in your set-up for centralized control. The P360EX is extremely portable and runs on broadcast batteries as well as AC power, offering greater flexibility when you need to shoot on location and away from power outlets. A durable light with an IP-24 rating, the P360EX works reliably heavy rain, freezing cold, and high humidity and its solid state technology eliminates travel concerns over broken bulbs and fragile parts. Lightweight, powerful, and easily modifiable, the weather-enhanced P360EX gives you an intense light that excels under any conditions. These high-end flicker-free lights provide consistent output with pristine 95-98 CRI ratings, water-resistant exteriors, and pliable framework that can be used virtually anywhere. The 1'x1' Flex Daylight LED Mats are perfectly balanced at 5600K to quickly and easily complement the available lighting on your next production. The 10x3" and 1x2' Flex Bi-Color LED Mats are designed with higher-output LEDs so that you don’t have to compromise output for versatility. These mats include a sleek digital dimmer that allows for precise color temperature tuning between 2800K and 6000K. The Quasar Tubes Q-LED X CrossFade Linear Lamp 4ft is a Variable Color LED replacement for a T12 4' fluorescent lamps. These 50 watt tubes produce 90 lumens per watt! Quasar lamps are dimmable, flicker free and 25,000 hr average life. Best of all the Quasar Tubes are rugged, built with aluminum frame and plastic front diffuser. They can operate as a single tube or ganged together for a large light source. Featuring a CRI of 95+ and no green or magenta spike. The X Crossfade lamps have a wheel at the end of the unit to scroll to the desired setting color temperature from Tungsten 2000K to Daylight 6000K. 120 volt AC power is required at just one end of the tube, reducing cabling needs. Each lamp ships with (2) Q Boots and (1) Quasar Grounded Female Tri-Pin to Grounded Male Plug.